This Ep was directed by the man himself, make up FX whiz Greg Nicotero of KNB fame. He is responsible for make up FX for dozens of films including Day of the Dead, The Evil Dead II, Halloween 5, The Faculty, John Carpenter’s Vampires, The Ward and of course The Walking Dead and the recent Predators movie with Adrien Brody. 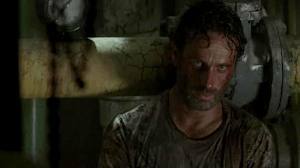 – Rick kind of goes off the deep end and runs, with an ax into the interior of the prison to kill off some walkers in his search for Lori. – Carol is still missing. – Hershel tells the group that the baby will need some formula and Maggie and Daryl take a dangerous ride into a nearby town to look for supplies for the newborn. Glenn meanwhile is concerned for Maggie and tells her he loves her and to be safe. 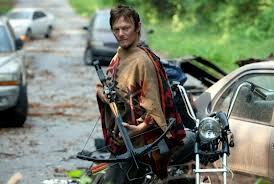 – Back at Woodbury Michonne sneaks into the Governor’s apartment and goes through his books and retrieves her sword. Not before she spies on him from the street trying to calm down his zombie daughter, Penny, after he rips dead flesh off of her scalp while brushing her hair. 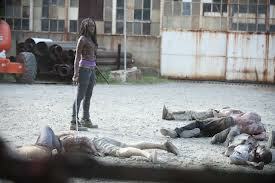 Michonne escapes from the apartment almost getting caught then proceeds to kill some walkers that are caged up nearby. She then gets caught. 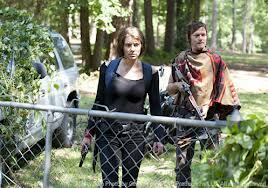 – Daryl and Maggie find some formula and supplies at a nearby day care house. 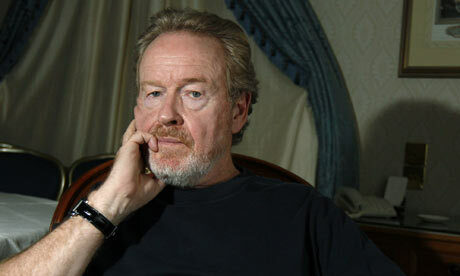 Daryl sees a hand-print cut out on a wall with the name “Sophie” on it and kills a possum for food. 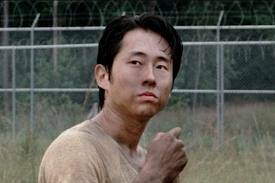 They make it back to the prison safely while Glenn picks off some walkers from the tower. Daryl feeds the baby and Carl suggests some names like Sophia or even Amy or Carol. 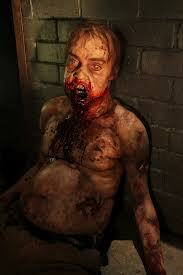 -Inside the prison, Rick picks off some walkers and finds one that has presumably gorged on Lori’s remains. Rick kills it and then starts to stab the zombie’s torso repeatedly. – At Woodbury, Michonne is interrogated by The Governor but she out smarts him and gets the upper hand while acquiring her sword and she leaves Woodbury leaving a saddened Andrea behind. 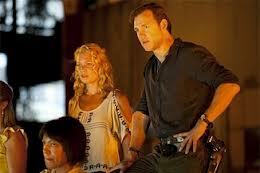 Before her release though Merle (Micheal Rooker) is seen speaking to another group member at the gates. It is a suspicious moment that doesn’t go unnoticed by Michonne and Andrea. – Later that night Andrea is disgusted by The Governor and his people as she is forced to watch a barbaric fight between Merle and Martinez with walkers chained up on all sides of them. Martinez is bested and almost gets bitten. 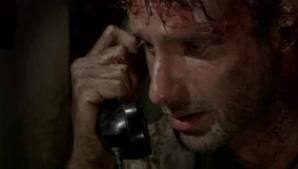 – Lastly, inside the prison in a very curious and suspenseful moment, Rick, while contemplating his next move hears a nearby phone ringing and goes to pick it up. 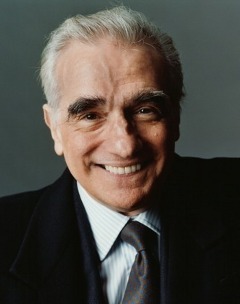 He says “hello” and the screen fades to black. Not a fantastic episode but it has it’s moments and remains intriguing and very well acted. 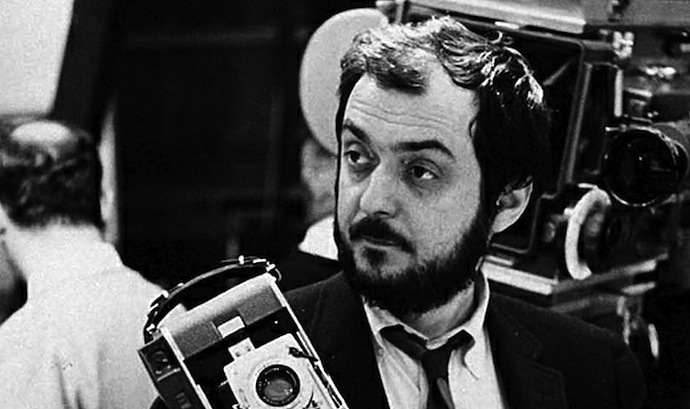 Props to Nicotero for his eye, good pacing and involving camera work. Good job, Greg!